Here's a list of the women golfers who made the most money on the LPGA Tour in 2017. The list includes all money made from prize money playing in tournaments plus all bonus prize money earned from the CME Race to the Globe competition. The list does not include endorsement money or other earnings outside of prize money. While the top player made a pretty good amount of money in 2017, she is well short of the record of the women golfer who made the most money in year. You can see the most money made by one woman golfer in one year here. Do you know how many women made over $1 million playing on the LPGA Tour in 2017. It was a record number and you can see the answer here. 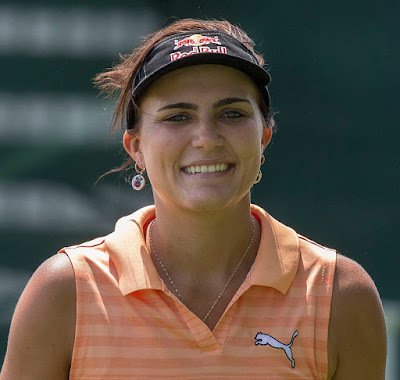 Lexi Thompson actually finished 3rd on the LPGA official money list for 2017, but Lexi won the CME Race to the Globe which is worth $1 million. So Lexi Thompson made $2.88 million playing golf in 2017 which is the most money made by any women golfer in 2017. For the 2017 season, Lexi Thompson won both the Kingsmill Championship and the Indy Women in Tech Championship. Lexi also finished in second place six times this season. That includes the Ana Inspiration where she was robbed of the win when the LPGA gave her a bogus four stroke penalty for resetting her ball maybe a centimeter from where she removed her marker. Despite that, Lexi still had a great season. Sung Hyun Park finished first on the official money list this year with earnings of $2.34 million. She also earned another $150,000 for finishing second in the Race to the Globe for total earnings of $2.49. Park won the U.S. Women's Open and the Canadian Pacific Open this season. So Yeon Ryu won the ANA Inspiration and the Walmart Arkansas NW Championship this year. She finished 5th in the Race to the Globe and earned no extra bonus prize money. ShanShan Feng came on strong at the end of the year to win both the Toto Japan Classic and the Blue Bay LPGA. She also won the Volvik LPGA Championship this season but finished 4th in the Race to the Globe and earned no additional bonus prize money. Ariya Jutanugarn made $1.55 million in tournaments this year and made another $100,000 for finishing in 3rd place in the Race to the Globe. She won the Manulife LPGA Classic and the season ending CME Group Tour Championship (which paid her $500,000) this year. Won Meijer LPGA Classic and New Zealand Women's Open in 2017. Now has 5 career LPGA wins at age 20. Won Lotte Championship and Sime Darby LPGA Malaysia in 2017. Now has 20 career LPGA wins. Won Founders Cup and Evian Championship in 2017. Now has 8 career LPGA wins. Did not win on tour this year and has yet to win a tournament. Won the Lorena Ochoa Match Play in 2017. Now has 6 career LPGA wins.